Once upon a time, there was a band called Cream. Fifty years ago they played the last two shows of their farewell tour, at London's Albert Hall on November 26, 1968. Eric Clapton played a Firebird I and a 335. He'd been playing the Firebird for a little over six months, but what about the 335? Thereby hangs a tortuous detective tale. This 1964 block-marker cherry Gibson ES-335TDC—we'll call it the Albert Hall 335—would end up selling at one of Eric's Crossroads guitar auctions for an eye-watering $847,500. In the 2004 Christie's catalogue, he said: "This is the second electric guitar I bought. I had a pinky red Telecaster, and then this. … I bought this brand new, either from Denmark Street or Charing Cross Road. … I went and bought [this] guitar [as soon as I saw it] with the first money I managed to save up [by] playing with The Yardbirds. … I've had it ever since." This had become the accepted story: Eric got the Albert Hall 335 during his time in The Yardbirds, didn't use it for years, and then dug it out again for the Albert Hall. When I wrote my book about 335s in 2016, I remembered something Jerry Donahue had told me. Years before Jerry came to prominence with Fairport Convention, Joan Armatrading, The Hellecasters, and more, he'd worked as a sales clerk at the Selmer shop in London. He'd told me he sold Eric a 335 just before the Albert Hall shows, and I'd figured he must be mistaken. Now I checked back with him. "My memories going back that far can often be a little inaccurate," Jerry admitted, "where just another day in the life is considered, but this was a huge moment for me, and my memory here is razor sharp. It was one of my main highlights of working at Selmer's. We had a nice conversation during the process, and just as we were wrapping it up, Eric mentioned the upcoming shows, in a manner that felt as though he was about to offer me a complimentary ticket or two. But I told him I'd already bought tickets, and he seemed pleased. You can imagine my amazement and joy later as I sat watching Cream come on to the Albert Hall stage, Eric with the 335 I'd sold him strapped on. He played that guitar for the entire evening. I was filled with pride." If that were true, where did it leave Eric's Yardbirds story? Eric joined that band late in 1963. The rhythm guitarist, Chris Dreja, usually played a block-marker cherry 335, while Eric usually played that "pinky red" Telecaster. Occasionally, Eric would pick up the 335 and Chris would switch to another guitar (in the early days a Harmony). Perhaps Eric was mistaken about the Yardbirds 335 and the Albert Hall 335 being one and the same guitar? After all, a lot had happened to him between 1964 and 2004. 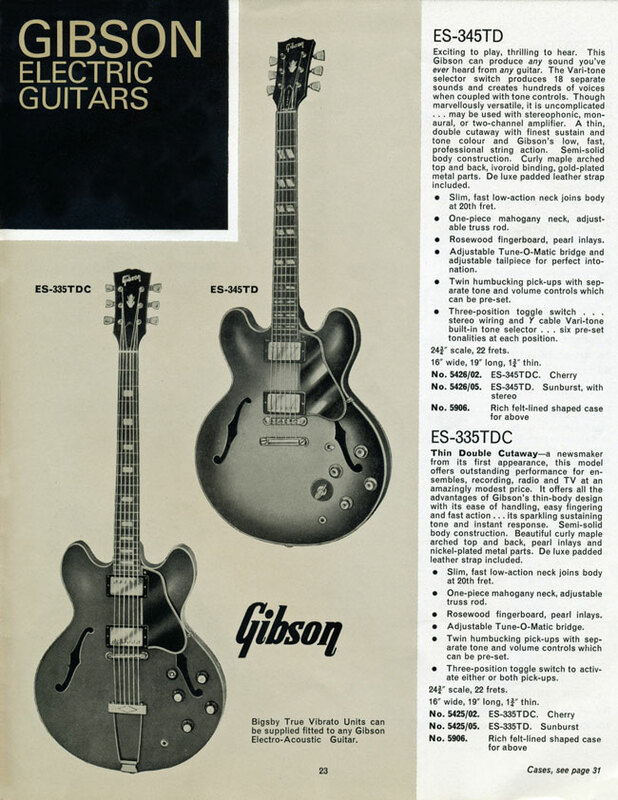 I checked the serial number of the Albert Hall 335 with Gibson's records, which revealed the guitar was shipped on May 20, 1964. But Chris was playing the Yardbirds block 335 well before that. There was a widely reported publicity stunt in May '64 where The Yardbirds played in the garden of Lord Ted Willis, who'd spoken that month in the House of Lords about "the problem of young people and leisure" and, on the subject of pop music, said: "This is a cult—a cheap, plastic, candyfloss substitute for culture." The Yardbirds' publicity guy spotted an opportunity, and the newspapers took the bait. Pictures of the garden event on May 17 show Chris playing his block-marker 335. The Albert Hall 335 wouldn't leave the Gibson factory across the ocean for another three days. Then I listened to a Yardbirds gig from '64 on a CD called Live! Blueswailing recorded at the Marquee on August 7 (or possibly July 31). Singer Keith Relf tells a story between songs about a speaker falling on the 335 which "broke Chris's guitar clean in two." More work poring over pictures told me the band immediately replaced the smashed 335 with a Jazzmaster, and then a little later, probably in December '64 or January '65, with a dot-neck 335. A few months later, Eric left the band for John Mayall and Chris continued to play this dot 335. It all underlined that the Yardbirds block 335 couldn't be the Albert Hall 335. Not only was Chris playing the Yardbirds guitar before the Albert Hall guitar left the Gibson factory, but the Yardbirds instrument was smashed in an accident and replaced. These are two different guitars, and that's how I summed up the story in my 335 book. More recently, however, some pictures have surfaced that seem to throw a truss-rod wrench in the works. The photographer John Peden shot a color roll at one of the gigs Cream played at the Fillmore in San Francisco in August '67. One frame shows Eric on stage playing his go-to guitar of the period, the psychedelic-painted "Fool" SG Standard. Just visible in one corner is a partial side-view of a guitar sitting out of the way on a stand. 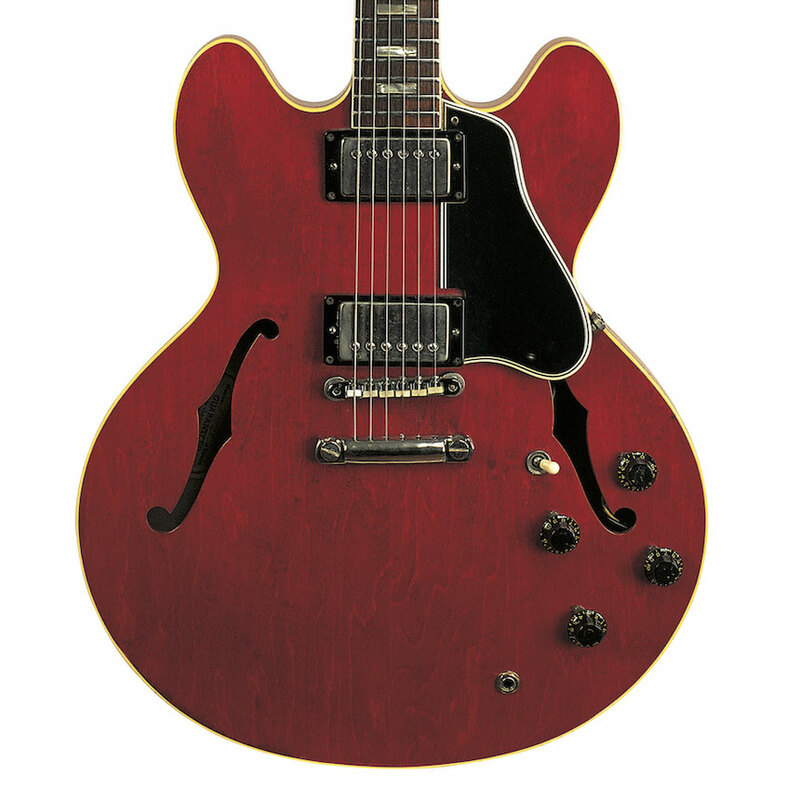 It looks like an ES-335 (or a 345 or 355). A couple of blurred frames show the roadie exchanging the ES for the SG with Eric. Frustratingly, there is no shot that clearly reveals which of the ES models it is. John recalls going early to the gig. "The room was empty, so I set my tripod right at the front lip of the stage. 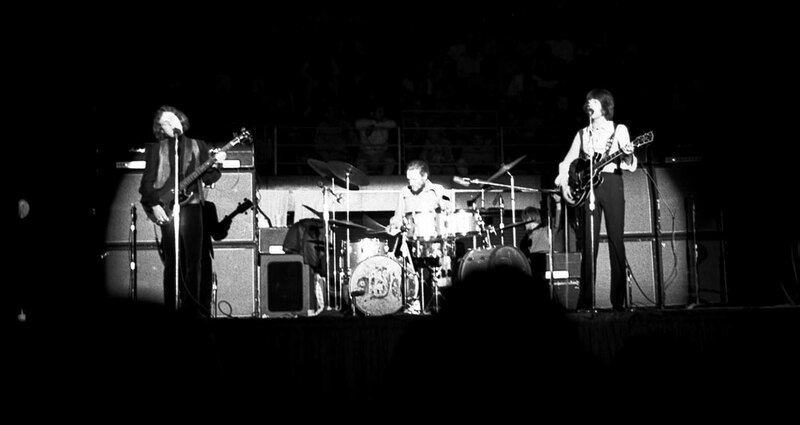 Cream were in full Summer Of Love regalia, Clapton with the Afro perm, snakeskin boots, white bellbottoms, the Fool SG, and the red 335, in front of two double Marshall stacks. When they started to perform, they absolutely captured the audience, who had not witnessed such fierce virtuosity. This tight wall of sound was spellbinding! Clapton played both the Fool and the red 335 about equally." The Butterfield Blues Band were on the Fillmore bill, so perhaps Eric borrowed the cherry 345 that Butterfield guitarist Elvin Bishop played? I asked Elvin about those gigs. "I remember no such thing as swapping guitars. What I do remember is sitting at a table upstairs in the Fillmore with Eric, B.B. King, and a totally incoherent acid casualty. Picture an Okie, an Englishman, and a blathering hippie, with B.B. sort of moderating the conversation and somehow making sense of the whole thing. I thought to myself, 'If the Martians ever land, we should send B.B. to talk to them.'" Could John Peden be sure the guitar he saw and partly captured on film was a 335? "I didn't know much about guitars then," John says, "but when I'd come back home after seeing Dylan with a Strat at Newport in '65, I had to 'go electric.' I couldn't afford the used Strat for sale locally, and I had to settle for a cheaper 335. So I was naturally pleased to see Clapton playing a guitar like mine. He played that red Gibson that night at the Fillmore." The second interesting picture that turned up recently is from the U.S. leg of Cream's farewell tour, which ran from early October to early November '68. Most snaps that exist of the band on that tour show Eric playing a Firebird I or a Les Paul Burst, but this photograph, apparently from the LA Forum in October, has him with a Gibson ES model. It was tempting to believe that this was a further potential sighting of the elusive 335. I asked Bob Adcock, Cream's tour manager, if he recalled Eric acquiring any new instruments at that time. "He didn't buy any new guitars on the last tour," Bob said. "I can be pretty certain of that, because if he had, it would have been me who would have paid for them out of the road float." On closer examination, the guitar in the Forum picture turns out to be an ES-355, most easily identified from a distance by its bound headstock, where a 335 has no binding. My guess is Eric borrowed it for a try-out. It's never seen again, so we can assume he passed on it. We're left with three possible scenarios—and I still favour number three. Clapton Hideaway: Eric bought the Albert Hall 335 in 1964 while he was in The Yardbirds. He never played it at the time and instead kept it hidden away for years, only pulling it out for a gig at the Fillmore in 1967. Then he put it away again until the Albert Hall shows. Why would he go so long without using what is clearly a great guitar? Fillmore Surprise: Eric bought the Albert Hall 335 in San Francisco in 1967, played it on one gig, and then put it away until the Albert Hall shows. Same question: Why would he avoid such a great guitar for so long? Selmer Shopping: Eric bought the Albert Hall 335 in 1968, a few weeks before the London shows, from Jerry Donahue at the Selmer shop. How come Selmer had a four-year-old guitar, one that either had been in the shop a while or was secondhand? "I guess he wouldn't have cared at all whether the 335 was new or not," Jerry told me. "He really liked it—the feel, the sound—it was perfect. Certainly it took no time at all for him to get his wallet out." Eric had a fine 335, whenever and however he got it. He profiled it in his 2013 book, Six-String Stories. "It was a rock guitar, a blues guitar—the real thing," Eric wrote. "It was played regularly over the years. It got on albums; it never really changed. It never got old; it never wore down. It never lost anything. I'd play it now. Anything that's been that long in my life and is still functional—there aren't too many things that can command that kind of respect." About the Author: Tony Bacon writes about musical instruments, musicians, and music. He is a co-founder of Backbeat UK and Jawbone Press. His books include The Gibson 335 Guitar Book, History Of The American Guitar, and Electric Guitars: The Illustrated Encyclopedia. Tony lives in Bristol, England. More info at tonybacon.co.uk. Tony Bacon would like to thank Bob Adcock, Elvin Bishop, Michael Chaiken, Christopher Hjort, Kerry Keane, Christian Larsen, John Peden, and Top Topham for help with this piece.